Intro from Jay Allison: Doug Mitchell affected the careers of many in the public radio vineyards, and they showed up at Transom to testify. Come download the latest Transom Review: Doug's Manifesto and conversation about his experience leading NPR's Next Generation Radio project: "Finding Them and Keeping Them: The Next Generation of [Public Radio] Talent." I should start off by saying that I have a pre-existing condition, a genetic code that I cannot avoid: I have always had the calling to teach. It’s in my blood. My dad taught chemistry and biochemistry for nearly 40 years. Two of my aunts (his sisters) were public school teachers for about 30 years in New Orleans and Detroit. My uncle (one of my dad’s brother’s) has a graduate degree in math, and teaches at a community college in Dallas. As for me, for 15 of my 21.5 years at NPR, my version of teaching was giving back. That’s an old-school term meaning that at one point in my life someone helped me, and after a period of time, I “gave it back” to someone else who needed help. After some years as a radio producer/director at NPR, I decided to create a training program for young people who wanted to break into the industry. I dubbed it “Next Generation Radio.” The program’s philosophical foundation was the notion that the best teacher/student ratio is 1:1. Having that in mind, and not having a lot of money, I set about working with a team of people in non-profit media who also wanted to give back. In 1994, I spoke with my good friend Traci Tong, (currently a producer for the public radio program “The World”) nearly everyday for six months, trying to figure out two things: How does one train young people in public radio journalism? And how is it done successfully in one week? The money was there thanks to Yoko Arthur who then worked for the Corporation for Public Broadcasting (CPB). Our launch pad was the first-ever “UNITY: Journalists of Color” conference held that year in Atlanta. We had 12 students; three each from the national associations of Asian, Black, Hispanic and Native American journalists. We had five mentors and one engineer. We started on a Sunday and finished on a Sunday. Somehow, we managed to produce two 30-minute programs in one week, on tape using razor blades and splicing tape. Today, one of those former students works for NPR in New York, another teaches journalism in Alaska. The seeds to pursue professional careers planted in them, the seeds to continue teach/mentor in radio in me. There are two main reasons these programs worked. One, a relentless focus on the process of doing the work — finding an idea, developing a story, recording it, organizing story elements, writing, editing, and producing and mixing a piece. Two, the serious thought put into who should be a mentor on boot-camps outside NPR, and with Intern Edition, who should be the leader. One of the most common questions I’ve gotten over the years is, “So, Doug, how did you know the participants were going to succeed?” Well, for the most part, I didn’t. I didn’t know they were going to be NPR’s Congressional Correspondent one day, or NPR’s Arts reporter. Check out this partial list. NPR’s interns began doing their own show during the summer of 1999. They chose an Executive Producer and set forth with no road map, to try to put together a show. The first show was 90 minutes long and very egalitarian — everyone contributed. I volunteered to help because they were right outside my office, because I saw them flying in and out of edit booths with tons of questions no one was answering, and because they were openly frustrated. I thought the show was way too long but thought the idea of doing their own show was original enough that it should be kept alive. I thought there was no better way for them get an organized, qualitative experience (and improve their job candidacies) than by spending their time working in a structure and process much like that of any NPR show, with someone in charge (Executive Producer), an editor (Managing Editor), reporters who have producers, and the creation of a website to document their work. NPR’s interns were chosen by department managers. Managers picked an applicant to be an intern in their department for a 10-12 week period. The interns could volunteer to participate in Intern Edition. I’d say 90 percent of each class participated. I hired the leader. Leadership is about having a clear vision of the end of the process and creative/methodical ideas about how to get there. I’ve met a lot of smart, socially capable young people. I like to think the EPs I chose were more than that. I’ve always believed that if I could choose the right person, that person in turn would choose the right people. The most crucial decision was on me. If I didn’t get it right, it wouldn’t work. That was something I had to learn along the way. Not all of the projects ran smoothly in the very early days. There were times when I picked the wrong student for an external project. I remember one who stuck the journalist organization with a $300 bill after she threw a party in her hotel room, raiding the mini-bar. During the past 15 years, we’ve had to send students home for bad behavior; during one project I had all my gear stolen. On another project, only ONE of four students finished their stories by the end of the week. I think in 1997, after a project in Chicago, I wrote a report to an NPR Human Resources staff member who was my mentor. I went on and on about all of the problems and said I wasn’t going to do it anymore. She wisely advised me to tear up the letter. We started regular conversations about what was going wrong (and right) with the external boot-camps and how to fix it. By now, I had experienced mentors to work on the boot-camps and inside NPR working on Intern Edition. As a team, we decided to focus more on student expectations, professional responsibility and a refined work-flow. This is why everyone should have a mentor and it’s why today I maintain relationships with over 300 people who were, at one time, in a student radio-training project co-sponsored by NPR. Well, that’s 300+ whose names I have on a spreadsheet. There are several hundred additional graduates of our program connected to me via Facebook. Not a week goes by without two or three former intern/next gen students sending an e-mail asking if I have a few minutes to strategize. Looking back, while we didn’t know a lot about project management, we worked hard to make a personal connection and then maintain that connection. Students on a project in the field, or at NPR as interns got to sit next to and query a working professional as they were struggling. Inside NPR, and mostly during the fall and spring classes, I arranged to have an NPR journalist mentor an intern who was working on Intern Edition. I knew who in the building would make a good mentor. How? Many of the mentors had at one time been interns or next gen students. Or they had taught in a former life or had just walked up to me and said “I’d love to help.” They remembered what it was like when they were learning. I paired them up based on the student’s story pitch and then talked to a staff member who could work within the subject matter and be tough but encouraging. Rarely did any NPR staff say they did not have time. On the external next gen projects I had to change the structure from that of standard NPR internships: less emphasis on hierarchy, more on one-to-one relationships. Students would apply and I would choose them. I would choose five. Why five? It started out that that was all we could afford. But I learned that with so little time to teach and produce, keeping our boot-camps small was vital for everyone in getting the work done. Here again I had to pick the right people and in this case, it was choosing the right mentors more so than choosing the right students. Our boot-camp Managing Editor was the most vital position. Over time, I learned that the ME must be a professional journalist who has worked on a daily deadline. Their day job could be editing a national show, editing/producing/managing newscasts, or years of broadcast editing or filing stories in any format on tight deadlines. The leadership team needed a clear, experienced understanding of public radio but a less rigid approach to ideas, who has them or where they come from. Students and mentors would be paired by me. This paring of students and mentors involved a lot of osmosis. I asked for very specific information on the application. This saved a lot of evaluation time. The more directed the public applications for the boot-camps, the easier it was to choose people. If a student met the written application requests, I could then add elements of open-mindedness and risk-taking to the mix. That means I could choose someone who had a great idea and no experience and/or a lot of experience and not a great idea. My openness is based on my belief that everyone is smart and capable and just needs a little help. One last thing about the boot-camps. We learned that we needed to operate them in much the same way a Mobile Army Surgical Hospital (M.A.S.H.) unit is designed. No matter what city, no matter what place, and no matter what space or conditions, we were able to deploy, set-up, perform, evaluate, break down and move on quickly and efficiently. We used a hand-drawn, visible-for-all-to-see work-flow chart with headers of nearly every aspect of building a story. Left to right, it started with focus statements and moved on to head-shots, interviews, photos, edits, mixed piece, to done. 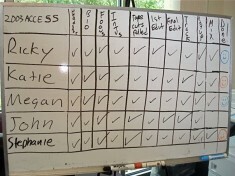 When a student-mentor team completed a task, they got a check mark. There were times it got very competitive and we all enjoyed every minute of it. In 2008, I raised the bar on our process. On the next gen projects with WUNC in Chapel Hill, NC, the “UNITY: Journalists of Color” in Chicago, and the College Media Conference in Kansas City we used Google documents and spreadsheets. These web-based applications meant we could document the developing workflow specific to our presumed conditions/infrastructure and keep conversations going. This template was established first for the mentors and students. By the time the team met for regular conference calls, those meetings were quick and focused. As the leader, I created and managed the information flow, ran the meetings and nagged the team to read the related documentation before getting on the phone. The UNITY project had 170 people. With this approach, our first lead team conference call in January lasted 90 minutes. Our last meeting in late June was barely 20. In other words, the shorter call time was the result of enforcing the process, getting everyone used to it, and eventually that discipline paid off. In Kansas City, each team used this web-based template as it moved an idea through the process as it developed into a story. People are busy, and often mentors and students in the boot-camps are not in the same city or even time zone. 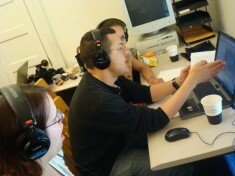 In the end, each team produced a radio feature and an audio slideshow of their work. Again, we accomplished more in less time by focusing on process. These projects were rolling laboratories where a mistake was fine, but on a deadline. We worked with a wide range of students. I believe many of them are in the system now because we went to where they are instead of waiting for them to come to us. I want to stress two things that seem to run against each other but in my case, worked really well. Number one: the importance of continuing to build upon already established relationships. For me, that means having former students become mentors once they start working professionally. A lot of money was spent developing people, making connections when they were young. The high level of commitment and passion for storytelling is there. To keep the commitment, you have to keep the conversation going. In any business, maintaining passion and commitment will provide a solid foundation for successful recruitment and then retention. People won’t stay if they lose their way. Businesses tend to blame the employee. 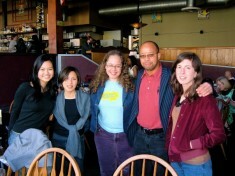 Some of my most cherished recruits left public radio within five years of first landing. And the bleeding continues. I don’t chalk that up solely to generational impatience. They left because of “management” issues. Not leadership, but management. They quit the network but didn’t quit non-profit media. They found new places because they made connections with others within the system. That is an example of leaders continuing to do everything possible to make sure the passion doesn’t die at the hands of being too busy, not having any money, or a lack of creativity or vision. I can’t tell you how many hours a year I spend with former students. It isn’t in the job description. I go ahead and do it anyway. Number two: a willingness to take risks on people you do not know and/or who didn’t come out of an already established pipeline. When I was in college, the public radio station on campus was, and still is, inside the journalism school. One day during my freshman year I literally wandered into the newsroom, expressing an interest in doing news. I talked to the News Director and he took me on. He was open to me trying out. I was very raw and didn’t know very much. That was in 1980 when I was 19. I didn’t start at NPR until 1987. In between, I interned on Capitol Hill in DC, worked in commercial radio, temped in a copy room at a law firm in Georgetown, and did time in retail too. But, if my old news director hadn’t invested so much time and effort in my development at the very beginning, I would not have the career I have. Yes, I can stubbornly focus, but one person at the very beginning made all the difference. And that is why the next gen program worked. Some suggestions if you want to get started developing your own next generation of journalists: If you are on a college campus you have a pool of people who want to learn what you know. Appoint a leader from the staff and make shepherding an intern program part of their job, NOT in addition to their job, but part of their weekly 40 hours. I can tell you that if you don’t have a staff member with laser focus nurturing the people and the program, it’s going to fail. Second, be sure to choose someone who wants to do it. This may seem obvious, but I’ve heard a few horror stories. Or, if you are the leader, and passionate about it, carve it into your own duties. Seek advice by getting out of the station and talking with others. If you already have someone in charge, think about what works best for the station, the school, the city, the licensee, the staff etc. What do you want out of a program geared toward recruitment and retention? Can you design a program that blends well with service to your community, school and public image? Again, one person with commitment and a willingness to experiment can make all the difference. That person will find others of like mind and then you will have a community and a talent pool and then you can find people. I can’t imagine a lack of talent these days. But, what are you doing to make sure you get the right people? You might not be able to send staff to conferences now, but can you create something locally? Oh, and find someone who in the face of being told no, finds another way, and then trust them. Reading the headlines today, the news is always bad. I’ve gotten to where I’ve wanted to bury my head in the sand. But, I read two blogs that change that feeling daily. One is by management guru and author Tom Peters and the other by marketing guru and author Seth Godin. You’ll find various quotes from them at the bottom of my e-mails and I believe I have to some degree echoed a lot of what they say in this article. Especially the part about finding something that simply isn’t done in your field and going ahead and doing it anyway. They say that that now is the time for reinvention. I agree, and I’m publicly trying to do that for my community. It’s time to look at systems, not just programs. Talent development must continue, not be eliminated. Find a way. Once you have the people you want, work to keep them. Don’t do things desperately, but methodically and deliberately. If you can’t help five, help one. 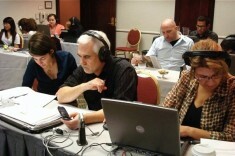 I’m still on the circuit, continuing to train a new collection of people all over the country. I’m working with a new team but we remain committed to working within the non-profit, public media space. We are reinventing with a focus on talent development and skill-building using all forms of media innovation. That sounds pretty lofty, yes? For me, each day is about continuing a conversation and building the community. If I were to score it, I’d say it’s a win everyday. 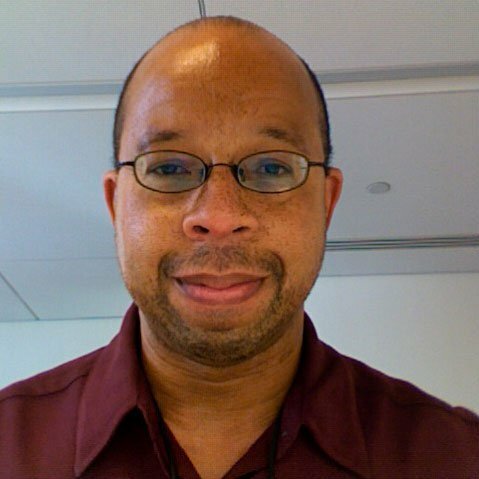 Doug Mitchell is currently a media/CMS trainer for AARP and a trainer/content developer for mojoco.org/New Media Institute/National Black Programming Consortium. He's based in Washington DC. Doug Mitchell’s contributions to the enduring greatness of public radio are not incalculable for they can be seen and heard every day. He trained, mentored and nurtured the careers of people who are now the most promising young hosts, reporters, producers and editors at NPR, its members stations, and dozens of other public radio outposts. My show at Sirius XM is one of the beneficiaries of Doug’s dedication to the training of young people in radio. Doug’s work was not the high profile stuff that won congragulatory cigars and champagne from public radio–yet it built the human infrastructure that keeps public radio going. Doug worked with the best of motivations—love for public radio—and the satisfaction of seeing the people he helped grow and prosper. I believe CPB should give its next Edward R. Murrow Award to Doug at a ceremony attended by the scores of young broadcast journalists who count him as a friend and mentor. getting an edit from Dale Willman. What a surreal privilege. I cant imagine the work it took for Doug to orchestrate. The story that most reveals character though concerns the class with which Doug carries himself and the enterprise. Were at the EJA in Seattle. This time Im assisting with training. One of the students has proven troubled, expressing contempt for structure and expectation to Doug and Mark Schramm. When she later voiced her criticism of him to a full auditorium, Doug could have defended himself by exposing how this student had acted-out and missed a deadline. Rather, he responded by modeling refinement, reaching out to her privately. Doug offered to help the student assess how this experience had played out for her, and how she might engage with future opportunities; thats mentoring. I’m thrilled to see Doug as the current guest on Transom. I gave a shout-out to NextGen on this very site when my first documentary was featured here. Now this feature on Doug gives me a platform to elaborate on that. When I was an intern at KUOW Seattle, a colleague asked Doug to include me in a NextGen project at the National Association of Black Journalists’ convention in Dallas in 2003. I was a "tweener:" too old to be a student, and not experienced enough to be a mentor. So I didn’t really fit into Doug’s plan at all. But his word to my colleague was that if I could get to Dallas, he’d find a way to let me participate. I got there, helped out where I could, and observed. A few days into the project, NABJ hosted a Q&A with Condoleezza Rice. International pressure was mounting for Charles Taylor to exile himself from Liberia. An NABJ member questioned Rice on this subject, and she made an unequivocal statement that Taylor must leave Liberia. Doug, his NPR colleague Danyell Irby, and staffers at KERA Dallas helped me file it as a wrap for NPR’s newscast unit. That was my first paid job for NPR. Doug assembled a team to support me–and all his students–from the host station KERA, from other stations, from NPR, CBC, and BBC. Everyone on the team was invested in my success. That type of working environment is rare, yet so valuable for people breaking into public radio from non-traditional backgrounds–ethnic, class, geographic, training-wise, etc. I was an outlier in every sense. Doug valued that as much as my mentors at my home station did. It would perhaps be gauche to list the opportunities that later became available to me after this moment with Doug and NextGen. The one thing I will brag about, though, is that I have been able to give back to NexGen three times over, as a mentor at NABJ and UNITY. KUOW supported that because my Program Director understood the collaborative nature of Doug’s work, and its benefit to the public radio system. I will always be part of Doug’s universe because I believe in what he does. I see how it has personally benefited me and the students I have taught through NextGen. I will always want to be part of that kind of teaching, and I’ll be looking for ways to continue KUOW’s participation in the outreach and training Doug provides. I love manifestos because they’re a way to put one’s passions permanently down on paper and because they replenish a sense of idealism. I’m quite fond of writing manifestos, but rarely do I read one that resonates with my feelings and our difficult times. Doug, you’re the best. And may you keep on doing what you do, either in or outside "the system." You can count on my Murrow Award vote. Rux. Thanks so much. I was trying to think of some other, more eloquent way of expressing myself. But, as I’ve learned from you by listening to you all these years at NPR and now at XM, why use a $5.00 word when a .25 cent one will do. Dana, had forgotten about that project. You being a trained psychiatrist can probably guess why I forgot. I’m kidding. We had a great team (as usual) on that project yet I think we as mentors learned more than the students. Difficulty can bring out the best or not. I have found difficulty causing me to re-think and adjust. Hence, when things didn’t go well early on, we put our heads together to figure out why and adjusted. Phyllis, I had to post that photo..mentors and former students. Each gainfully employed. I think you were the second "non-traditional student" we had on a project. Celeste Headlee, of late on a contract reporter for NPR’s Day-to-Day, was the first where I decided to go outside of the rules and let someone in. That seemed to work out as well. Thanks for sharing your journey and stressing how important it is to pay it forward and back, so to speak. Your emphasis on turning former mentees into mentors is a great one, as is your stressing the idea of building community. Given current economic turmoil, stress and anxiety, as well as technologically induced upheaval in media delivery and consumption, the path to a career in radio may seem a bit daunting to young people. Beyond wandering into the college radio station, have you other suggestions for aspiring young audio producers trying to find their way? Thanks again, Doug. You need to be cloned! I wandered there because I could. In those days there wasn’t a locked door. There is now. I’ve seen many public radio stations wall themselves off from everything else (mentally as well as physically) and then turn around and wonder why know one is interested. "Radio’s dead," they would say. Humph! No it is not! It just needs to be a little different. Stations are in a bit of a pickle. Keeping the loyal and bringing in the new. If I were a station’s director of content (Yeah, I chose that title for a reason) I’d try something heinous and radical…put students on the air…playing music on weekends. Have them broadcast live from clubs in my city. I would take full responsibility for it and methodically build value and community. I would hire as many web producers as I could, maybe as interns first and then raise money around my new online-exclusive programming. I would take the branding space that is there in my region. If no one is there yet, go take it. I did this with the next gen projects. "Radio is dead." Really? So, we took that space because we could. My hunch has always been that it’s less incumbent upon youth and more upon we grown-ups to step it up, create a some kind of structure and invite everyone in. There are stations thinking this way. I won’t name names but let’s just say a few of those managers have seen me show up over the years…..because I could. Doug’s work is more influential than we know. I am teaching 2nd year Masters candidates in Journalism at Ryerson U. in Toronto. I was asked to design and teach a course called "New Journalism Forms." No idea what that meant, but I was given carte blanche to do as I saw fit. I thought it meant doing some "innovative" things – like running audio backwards, arranging slide shows with no narrative…you know, stuff that can be seen as "creative." But I decided that this needed a solid journalistic centering. So I asked my 27 students to design a template for covering a breaking news story using as many platforms as possible and having a business plan to go with it. We decided to use the tragic events in Mumbai as the event and the students have come up with a plan that is inventive, imaginative and possibly one that can be monetized. We wrestled with issues of immediacy, credibility and involving citizen journalism. We have another few weeks before we present it to "management" – aka, the chair of the department and the head of the grad program. But Doug is the inspiration behind this. This project has "Mitchell-ness" written all over it. One added benefit: in these desperate times when journalism is struggling to survive, I am more optimistic about our futures than when I started teaching this course 10 weeks ago. Thanks Doug. Thanks for the props Jeffery. I like that you are asking your class to obsess over the process as much as the actual product. Media producers/journalists etc often complain that they are only as good as their last story. Meaning, they knock themselves out making it public, they are judged on that story and if it went well, they are great people. If it didn’t, they are not so great. The body of work is not under consideration on a daily basis unless someone is up for a lifetime achievement award. But, to me, I’ve always believed that if you "master the process, you can master to work. If you (additionally) become a master of HOW it gets there and work to refine, refine, refine…you can develop a good reputation. You seem to have created a newsroom? 27 people, whew! But, all can have a qualitative role in developing the product to present to the audience. When I taught in Chile, the journalism school where I worked adopted and deployed the phrase "Aprender Haciendo"…to learn by doing. In media/journalism training this is a guiding principle and I’m glad you have placed it into an academic setting. It works…. With tight finances making it more difficult for young people to even attend college, much less afford the luxury of non-cash paying internships, the pickle you describe stations as being in is going to turn into a gigantic cucumber patch! If young people can’t get in the door, how are they going to shake things up? If management is cutting jobs, training opportunities, and and afraid to try anything outside the box, seems like there will be a long dry spell for aspiring journalists in terms of moving into the public radio field. Or am I just seeing a glass half empty? What kinds of stories are you hearing in your role as trainer/content developer for mojoco.org? How’s morale? Glass half full, my friend, half-full. Have been in a (continuing) series of meetings during the past month about designing and implementing media training projects for college students at conferences this coming summer. Each of the five organizations I work with has a lot less money. We all know why. Institutions, media and academic, also have a lot less money to create opportunities for anyone. We all know why. But, is it the end of the world as we know it? Paid internships/training opportunities have never been the rule industry wide. I did a paid summer internship on Capitol Hill in DC and didn’t go into politics. My unpaid internships in media and ended up there. NPR pays, but only in summer. I think there are a few other institutions that have paid internships but the numbers are small per group. But here is my larger point, paid or not, to get ahead in anything one has to make and then act on some educated guesses. You have to have a lot of guile and a little bit of luck. You have to focus while being flexible. I don’t care where it is. We’ve all have had to do this at some point in life. Not sure where it’s written that stuff gets handed to you. A final point: The media student projects this summer are going to be much smaller but I’ve tried to emphasize that this shrinkage is an opportunity. Media is evolving and hence the training for a career is evolving too. This summer is a chance for these essentially service organizations, to re-position themselves for current and coming members. We’ve chosen some great young people and have active, progressive mentors too on each project. Many of the mentors lost jobs like me but are still committed to setting an example and the leadership of these journalist organizations has a clear understanding that and are stepping up as well. In these tough times, it is more important than ever that youth (and rural folks and low resource folks and immigrants and elders…) can access the technology and communications skills to make sure that all voices are heard in our society. The ability to clearly, eloquently, and passionately engage in the community conversation is a life skill that needs constant refinement. I love hearing these stories about Doug’s influence on the Next Generation. He is an amazing model of generosity coming from an institution that has not always been equally generous with its staff, freelancers and trainees. But, Doug shows us how to use the resources of the institution for the much larger goal of community empowerment. Yay, Doug! I know you and your vision will find a home soon to continue building generations of communicators. Just as in the past a good liberal arts education prepared one for whatever career one might choose, I think that today a good technology and communications education prepares the next generation for all the work ahead. And I think that "public media" as a whole will only increase in importance as we shift completely into this Age of Information. Sure, there might not be abundant funding right now for documentary productions. But at the other end of the spectrum, if you are interested in reaching people with your message or story, there are free YouTube channels where these communications skills are just as critical. I hear there is even an art to writing a good 140 character Tweet. 😛 And who knows what will be next. Mentors, trainers, editors, directors and producers have the opportunity to "pay it back" every day, with every story and every conversation. We can elevate the whole community conversation by starting with the people who are directly in our sphere of influence. Look around and see how you can be like Doug. Thanks for taking the time to put your thoughts out there, friend. And for making a place for me to send mine back to keep the conversation going. manage a place in radio given my situation. Better make sure this one posts smiles. I can honestly say that Catherine Stifter, Loretta Williams and Cathy Raines who were the ones that told me to keep going during the tough, early days of next gen radio. It’s only natural for me to turn around the do the same. Even during the dot-com craziness of the late 90’s (when I met Ms. Lewellen), I was but a few years into training but looked to turn it around. In 1998 a colleague and I launched a website called "Freshwav.com. : It’s goal was to train people who had radio programming ideas, aggregate them and sell them to media outlets. Karen and I spend hours on the phone as she kept pitching, trying, asking, failing and trying again. Because she could. Freshwav.com was to go around all the big media gatekeeping by using the internet to give voice to ideas that were ignored. 10 years later you can find those ideas online and for free. Freshwav didn’t survive as a business. But the experience taught me many lessons about working with people and using technology to grow a community. One thing has always stuck however…everyone is smart, has an idea and should be given a chance. Not everything will work. Some ideas will be miserable failures. People should not be punished for trying. I’ll sign off for now. More things happening in the coming few months so stay connected. Jess Naudziunas, Jess Abeita, Katerina Valdivieso, Catalina Jamarillo, Julia Thompson and Yanmei Xie. The future so bright I gotta wear shades…..